rFpro is being used for driving simulation by 6 of the top 10 OEMs as well as many smaller OEMs and T1s for Virtual Test programmes of vehicles, subsystems, ADAS and Autonomous control systems. Claytex is an rFpro distributor and system integrator. We have worked with rFpro on numerous projects since 2009. The unique feature of rFpro, compared to traditional driving simulators, is that it allows driving simulators to be used to test the vehicle dynamics of road vehicles. By delivering a high resolution road surface in real time, while generating accurate realistic graphics without lag, professional test drivers may contribute to the engineering process while the car design is still model based. An rFpro driving simulator can be used to test emergency scenarios with a human test driver in complete safety. rFpro makes it easy, and safe, to test ADAS and Autonomous control systems’ interaction with human drivers. This testing establishes the performance of the control systems despite inappropriate control inputs from human drivers inexperienced in vehicle control in an emergency situation. 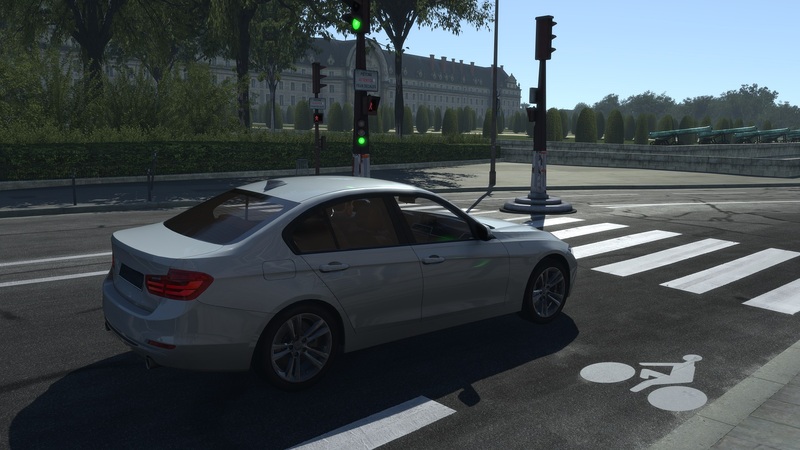 The use of an rFpro simulator allows testing with virtual pedestrians, cyclists and other hazards. Being able to virtually test emergency scenarios shortens the test cycle as new control systems, algorithms and sensor models can be tested and calibrated in simulation, while still using human test drivers, without the need for physical testing in real cars. The benefits of receiving feedback from professional test drivers early in the engineering process reduces risk and reduces delays later in the project. The savings in time and cost can be significant over the life of a project. Because rFpro driving simulators are capable of testing vehicle dynamics, the entire ADAS tool chain may be tested in combination with the vehicle physics model, stability control and braking systems to evaluate emergency manoeuvres under human / ADAS control. Testing in rFpro may be software in the loop (SIL) or Hardware in the loop (HIL), so the combined capabilities offer very significant cost and time savings compared to real world testing. By running your sensor models, algorithms and control systems in an rFpro driving simulator your engineers benefit from rFpro’s award winning Digital Road Models, built to extreme levels of accuracy, allowing you to conduct tests in simulation that will correlate very closely to real-world testing along the same public road test routes. By carefully controlling virtual conditions such as weather, time of day, time of year, turbidity, quality of road markings, large amounts of testing can be done on extremely accurate copies of the real world, validating and calibrating algorithms. rFpro also allows the testing to be further extended to add simulated Traffic into the simulated world, which allows not only testing and validation of algorithms against known ground truth, but also testing of sensor fusion against known Traffic object lists. A further benefit is that this testing can be combined with live real-time testing of the control systems that make use of the simulated data, allowing testing of the entire chain with a professional test driver in control of the test vehicle. rFpro driving simulators are being used to test passive chassis designs and steering systems as well as to achieve consensus between subjective and objective measures for attribute engineering. By testing in rFpro, very early design decisions and platform architectures can be evaluated with a professional test driver, years before committing to physical design. 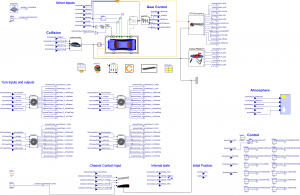 rFpro allows engineers at Workstations and professional test drivers in rFpro simulators to test and calibrate the control systems that affect vehicle dynamics; chassis, drivetrain, engine and ADAS very early in the engineering process. For example, being able to test and calibrate stability control, traction control and torque vectoring in rFpro allows far more testing in extreme limit performance situations, without the need for expensive prototype cars, in safety, in repeatable controlled conditions. Using rFpro driving simulators and Workstations in-the-loop with a drivetrain dyno to test and calibrate powertrain and engine control systems saves time and money. AVL estimate that using rFpro has saved them 30% of their up-front costs on such powertrain projects. The benefit of rFpro’s highly realistic driving environment, with high quality graphics, ensures that the car is driven and controlled realistically by the test driver. The single greatest return on investment (ROI) from rFpro results from implementing a Virtual test program. The engineering process for OEMs is sufficiently established that implementing process change that deliver cost saving efficiency improvements of a few percent are considered successful. Virtual Test in rFpro has already delivered savings of tens of millions of dollars on a single model’s test and validation programme. rFpro allows OEMs and T1s to involve their professional test drivers and engineers in the testing and validation of cars, systems and components while the vehicle is still at the model-based engineering stage, before any commitment is made to physical design. By engaging real test drivers earlier in the process, more of the changes resulting from the test and validation processes are made earlier in the engineering cycle which delivers very significant cost savings. rFpro offers a scalable solution that works on an engineers workstation and supports multi-channel dynamic simulators with full motion and everything inbetween. An engineering workstation simply requires a high-powered PC, with the latest, top-end graphics card coupled with simple gaming controls. The focus here is on studying the interaction of the vehicle systems and starting the journey to understand what can be achieved by the combination of rFpro, high fidelity digital road models and your vehicle model and control systems. rFpro does not include a Vehicle Model. It is designed to wrap around your vehicle models and includes off-the-shelf interfaces exist for all the mainstream vehicle modelling tools across a wide variety of platforms. Interfaces operate via FMI, Simulink IO Block or S-Function, UDP or C++ API spanning Windows, dSPACE, Concurrent Realtime, Speedgoat etc. If you have your own vehicle model running on real-time hardware then we can provide Simulink blocksets to define the interface between the model and rFpro that are ready for compilation to dSpace, vTAG, Speedgoat (and many more). There is also an API for writing your own code. We can run alongside your model on a Concurrent solution, taking advantage of its 64-bit, multi-core environment to run our Terrain Server surface modelling in real-time. This will share memory with your model, eliminating the external communications for the highest bandwidth components. Since 2007 rFpro has built Engineering quality and photo-realistic High-Definition (Hi-Def) circuit models from accurate LiDAR surveys. The LiDAR-based track database increases every year and now includes most of the F1 circuits, North American Indy & NASCAR circuits as well as La Sarthe, and the 20km Nordschleife. Public road routes, including specially commissioned OEM test routes can also be modelled, all with accuracies to within 1cm in x and y and less than 1mm in z.
rFpro supports a plugin architecture which enables users to replace any or all aspects of the simulation with in-house models developed in Dymola, SIMPACK, CarMaker, CarSim, AVL VSM, LMS AMESim, C++ or Simulink, or with any vehicle model that supports either a Simulink interface (IO Block or S-Function), FMI, or a C/C++ interface (source, .lib or .dll). The models can be supported using in-line simulation on PC, vTAG310, PTWinSim as well as HIL with Concurrent realtime, dSPACE, vTAG-RT and SpeedGoat. Claytex has developed the VeSyMA – Driver-in-the-Loop solution to ease the integration between Dymola developed vehicle dynamics models and rFpro. Using this solution, the vehicle model is plugged into a model template in Dymola and then functions guide the user through the export process and produce a PTWinSim or vTAG app ready to be plugged into rFpro.